An accomplished Venable Village elementary teacher that started her teaching career late in life is already making up for lost time. The spotlight team and Venable Village staff had to get a little creative, when both the auxiliary spotlight and teacher spotlight were working in the same room. The team decided to play a trick on the ladies, and made them each think the other one was being honored. Rushing into the room the crew honored computer aide T’Essence Long first, and her confusion was apparent. 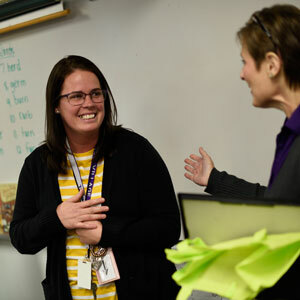 Watching from the sidelines was teacher Natascha Gardner, smiling as she thought Long was the only person being honored in the room. That thought was about to change. The group spun around to the teacher and surrounded her with applause and cheers. Looking around the room, Gardner smiled nervously as she realized that she had been duped. Principal Jo Wasson walked over to the teacher and explained why she had been nominated for the Teacher Spotlight for the Month award. “You know so much about your students,” said Wasson. “She is so wonderful with them and you can see how much she loves her kiddos. Going to college after her children got older, Gardner worked as a social worker before deciding that she wanted to see the other side of helping students. “At a very young age I knew that I wanted to work with kids,” she stated. “And I knew that I wanted to be in education, so I eventually came here as an inclusion aide. 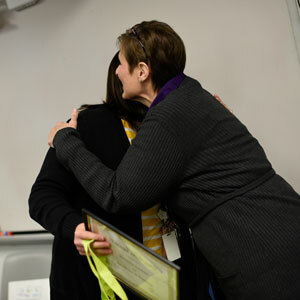 Gardner works hard every day, wanting to give her students 100%, sometimes that is a challenge for the teacher, but Gardner doesn’t believe in settling. “I am hard on myself,” said the teacher. “I don’t like letting people down, especially my students. 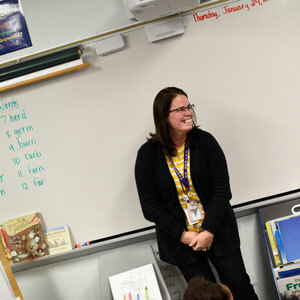 Gardner wants her students to be proud of themselves and their accomplishments, and to never stop growing and learning. Thanking the Venable Village staff, Gardner was grateful for all of the help that she has received since becoming a teacher.